I apologize for being late with this review but life happens… Anyway lets get to it! 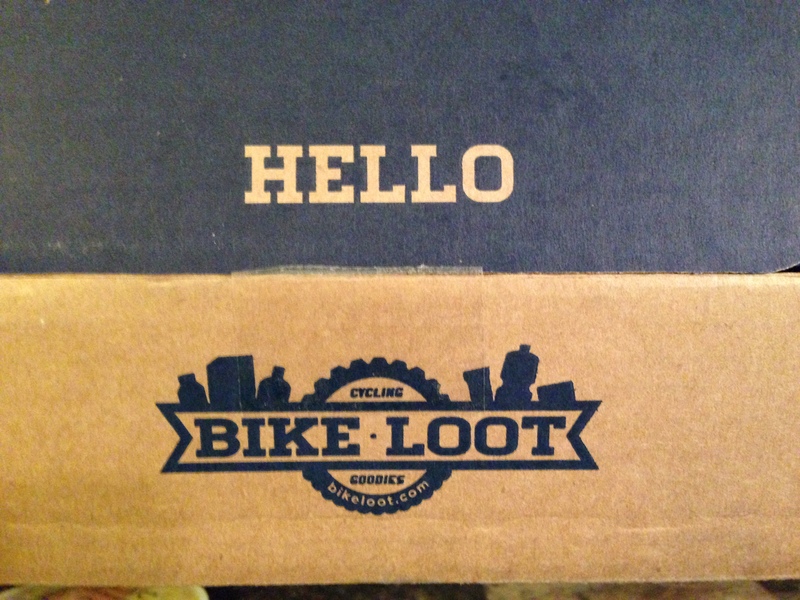 This months Bike Loot surely won’t disappoint with 5 pretty interesting products. Next in the box was a packet of Bottle Bright which is a bottle cleaning tablet. We’ve all suffered from that bottle funk and these cleaning tablets claim to be THE BEST bottle cleaner… EVER! My go to bottle these days is a Specialized Purist so I don’t suffer from bottle funk any longer but it also can clean stubborn coffee cup stains – so you know where I’ll be using this! 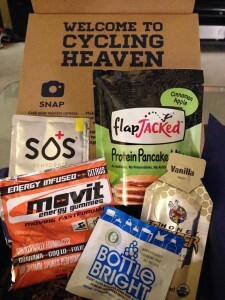 I was no stranger to the third item in the box – Honey Stinger Vanilla Organic Energy Gel. As I have said before, I love me some Honey Stinger and always carry a gel or two with me on those long bike rides – I always carry extra energy products with me just in case someone else in the group needs a pick me up. It’s an all organic product and tastes yummy too. What more can I say. Get the Buzzzzz. The fourth item in the box had me sending out an SOS. No not that type of SOS – SOS Rehydrate Electrolyte Drink Mix. This sounds pretty interesting as it’s a fast-acting electrolyte & hydration drink that has been engineered by a leading doctor, athletes and a military medical officer. It claims to give you 6 times more electrolytes, 20% more hydration and 75% less carbs. Sounds like a good alternative to just plain water if you don’t want to take in all those carbs of a typical sports drink. I might just try this when I’m working outside in the heat and not while I’m on the bike. Lastly this month we have Movit Energy Gummies. This is a new and fast growing energy company. These have been scientifically engineered for optimal performance and delivery. The citrus flavor sounds appealing so I can’t wait to give these a try and will certainly see how they stack up to my regular go to energy chews. 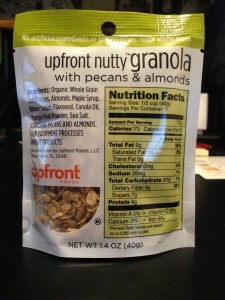 I received a package of Upfront Nutty Granola as part of my April Bike Loot box which I reviewed here. To my surprise I had never tasted or even heard of this brand before, but after looking at Upfront Foods website it doesn’t appear to be in any stores in my area yet. 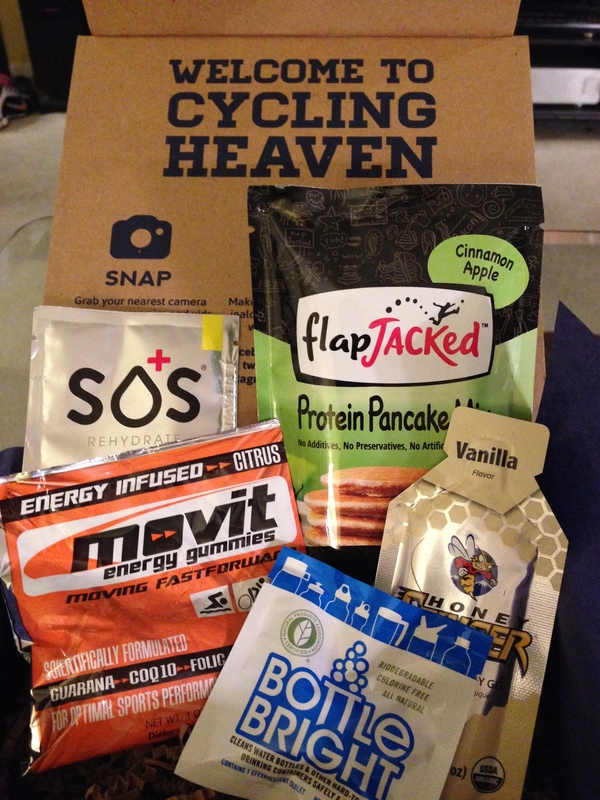 The first thing that struck me was the packaging; it’s the perfect size for a snack (or even putting in a cycling jersey) and all the ingredients and nutritional information are right on the front (hence the company name Upfront). Because of upfront labeling it’s very easy to see that it contains all natural ingredients with no hard to pronounce artificial ingredients or preservatives. If for nothing else, the packaging size had me sold. Most other granola is sold in larger bags and when you love it as much as I do that quick snack turns into 3/4 of a bag. Oops. 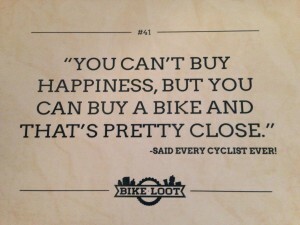 Plus if you want to take some cycling with you that meant separating it into small baggies – far too much work for me. This neat little packaging solved both those problems. But I did wonder how different is this going to taste from all the other granola I’ve had in the past? So without further ado here are the gratuitous unboxing photos.